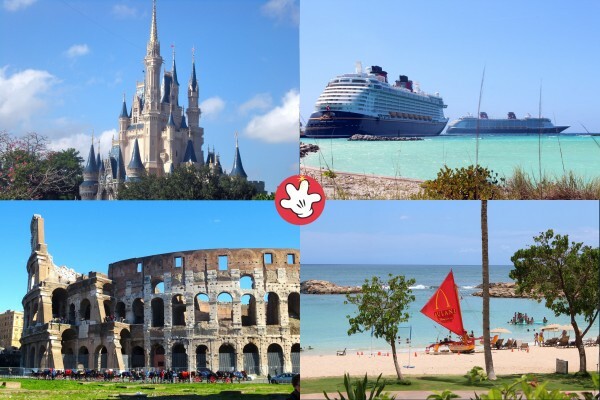 Disney Vacation Planning by MousePlanning! Walt Disney World Resort – More than just a theme park, this unique vacation destination is about twice the size of the island of Manhattan. It has four theme parks, two water parks, dozens of hotels, hundreds of restaurants, a sports complex, championship golf courses, and more. The perfect family vacation destination! There is no way that a person can experience all that Disney World has to offer in a day, a week, or even a month! It is the ultimate Disney Vacation destination! Disneyland Resort – The original Disney Theme Park in Anaheim, California is where you can literally walk in Walt Disney’s footsteps. Boasting two theme parks — Disneyland Park and Disney California Adventure Park — this resort is a destination in and of itself, and is also perfectly situated to be part of a grand Southern California vacation. Disney Cruise Line – Experience the magic of a Disney Vacation on the high seas on board one of Disney’s four cruise ships: Disney Magic, Disney Wonder, Disney Dream, and Disney Fantasy. Whether you are looking for a family cruise or an adult’s only escape, Disney Cruises are an excellent choice! Adventures by Disney – Experience more than a dozen destinations across six continents, all with a touch of pixie dust. With VIP service and unique experiences, Adventures by Disney takes care of all the details, allowing you to focus on enjoying quality time with your family in amazing settings. Aulani, A Disney Resort & Spa – Located on the Hawaiian island of Oahu, Aulani was inspired by the wonders and traditions of Hawaii and has been uniquely designed for families. Click here to request a no-obligation quote!